Throw all the rocks you want... it's BULLET PROOF Glass! This one was going great until bedtime came around. You'll notice the sleeping quarters are, well, crappy. 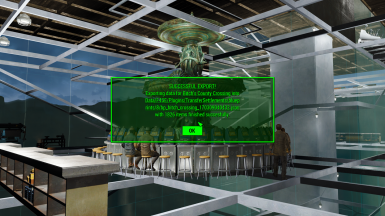 This is due to the fact that NPC's can't find a freaking doorway, and that was the only way I could get them into bed. Maybe you'll have better luck and can clean that mess up. LOL! Other than that, they can navigate everywhere else quite nicely. 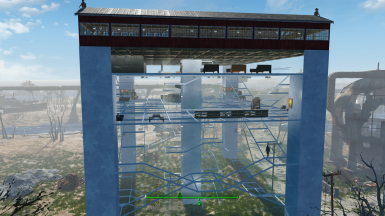 You can't really tell in the screen shots, but the entire thing is enclosed in glass as is the center stairs/ramp. 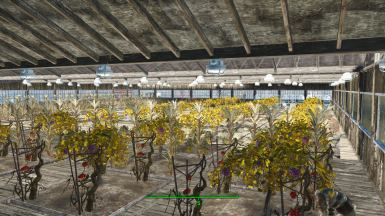 Main power, water and the settlement beacon is in the green house. There is another generator attached to the back side of the slot machine facing the bar. 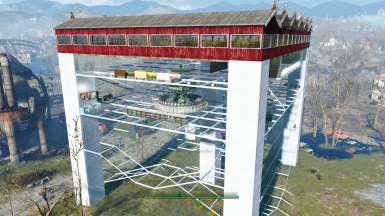 Backup to the workshop workbench, now scrap/store everything from there to the build boarder. Optional... but REALLY recommended..1 cause they're really kool and 2 cause you 'll be missing stuff if you don't have them.